Pro Libertate: Happy Insurrection Day! 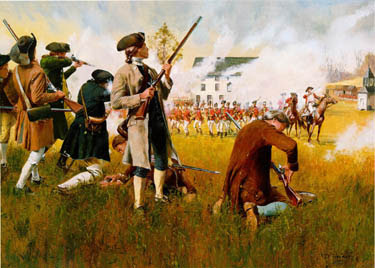 Minutemen gun down soldiers of the Empire, April 19, 1775. It has often been said that if voting actually changed things, it would be illegal. In much the same sense it could be said that if the genuine meaning of the event commemorated on the Fourth of July were to become widely known, our rulers would respond by criminalizing the celebration and the document that should be at its center. This isn't a hypothetical proposition. Around the turn of the 20th Century it was common for "Wobblies" -- radical activists belonging to the Industrial Workers of the World, a schismatic socialist sect -- to be arrested for reading the Declaration of Independence in public. the claim that governments derive "their just powers from the consent of the governed" and that "whenever any Form of Government becomes destructive of these ends, it is the Right of the People to alter or to abolish it," many of them assumed their ears were being assaulted by the rhetoric of foreign subversives. A few years later, after the regime of the unutterably evil Woodrow Wilson had maneuvered the United States into a European war on the side of Great Britain -- still regarded with understandable suspicion by the Middle Americans expected to provide the coffin-stuffers for the conflict -- public recital of the Declaration was ruled a violation of the Espionage Act. At least one man was sent to prison for the supposed crime of reading aloud from Jefferson's document. In his war message to Congress on April 2, 1917, the detestable Wilson demanded of Americans nothing less than complete and perfect uniformity of opinion and behavior. He also deputized Americans to assist the state in "rebuking and restraining the few who may be of a different mind and purpose" than that ordained by his government. "If there should be disloyalty," Wilson promised, "it will be dealt with with a firm hand of stern repression; but, if it lifts its head at all, it will lift it only here and there and without countenance except from a lawless and malignant few." Less than a century and a half had elapsed since a "lawless and malignant few" had gathered in Philadelphia to certify their disloyalty to the King of England -- or, more properly put, a small group of principled men who understood government's subordinate role in human affairs assembled to withdraw their consent to be governed by that man and his minions. The Declaration articulated some indispensable truths. The first is the understanding that individual liberty is a gift of God, and the powers of government are contingent and revocable. A man can live without government, but he cannot live, as a man, without liberty. Second, the single greatest enemy to individual liberty is the government claiming the right to rule that individual. The third, and most troublesome, of those truths is this: There is an inherent right to rebel against the supposed authority of any government that becomes "destructive" of the rights invested in the individual by God. That right, like all others, inheres in the individual. But it can be exercised collectively in the form of principled, violent insurrection when such action is justified. Most of the rest of the Declaration consists of a legal brief justifying the insurrection already underway in the British Colonies, and the decision to sever the political connection between those polities and the British Empire. 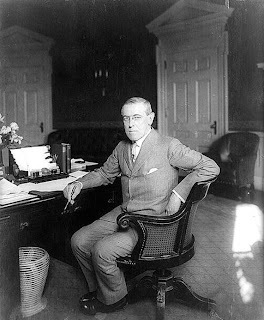 Self-enraptured mass murderer: The unfathomably vile Woodrow Wilson pauses at his desk to pose for a photograph. And then ... it's back to the merry business of plotting war, conscription, confiscation of wealth, and repression of individual liberties! It's hardly surprising that the Wilson regime effectively criminalized the Declaration: Like collectivists of all ages, Wilson assumed that man, who was created for the state, should be pitifully grateful for whatever transient "liberties" he was given by the state, and should be prepared to sacrifice everything on behalf of the state. "It is not an army we must shape and train for war, it is a nation," Wilson declared, as he centralized the economy, orchestrated a frenzy of war hatred against Germany, and moved to impose conscription. His Vice President, Thomas Marshall, urged that citizenship be formally revoked for anyone found to be "not heartily in support of the Government in this crisis." Bernard Baruch, chairman of the War Industries Board and de facto commissar of the economy, explained the logic of Wilson's war regime in admirably frank terms: "Every man's life is at the call of the nation and so must be every man's property.... The state is all; the individual is of importance only as he contributes to the welfare of the state. His property is his only as the state does not need it. He must hold his life and possessions at the call of the state." Just as every man's life was considered property of the state, so were every man's offspring. This was made clear by the demented Theodore Roosevelt: "Any man who says, `I didn't raise my son to be a soldier' isn't fit for citizenship. That statement is on the same moral level with saying, `I didn't raise my girl to be a mother.'" Raised to die on behalf of the State? Just a few of the many young men from Clovis, California who have died in the Idiot King's worthless war. Killing and dying on behalf of the state -- the congealed essence of lethal violence -- was thus defined as a moral exercise as exalted as bringing life into the world. Or, as Bill Kauffman observes in his invaluable new book Ain't My America, to WWI-era collectivists like Wilson and Roosevelt, "Mothers were brood sows. Sons were herded into the abattoir." Vaulting over the blood-stained decades that followed Wilson's administration, we find that today's adherents of the cult of the nation-state aren't content to send just their sons to the slaughterhouse; many of them are dispatching their daughters as well. This was memorably dramatized during a recent "Military Appreciation Sunday" service at the Bell Shoals Baptist Church in Brandon, Florida (a video of which was very generously provided to me by a friend). The service featured Lt. Col. Steve Russell, who commanded the troops who extracted quondam subcontractor for Washington Saddam Hussein from his "spider hole." The proceedings began with brief remarks -- laden with pious poses and orotund vowels -- by the late Pastor Forrest Pollock, in which he gave a detailed recital of the evils perpetrated by Saddam while he was on Washington's payroll -- a remarkable exercise in mote-obsession and beam-ignoring. He then urged attendees to pay heed to a nauseating video presentation offered by Russell's GOP-jingo PAC, Veterans for Victory. The video first depicts a father in his 30s rising early in the morning to kiss his wife and son, then depart, clothed in the habiliments of the Empire's contract killers, to murder people in a distant land who have done our country no harm. Wretched as that spectacle is -- almost unbearably so, given that it is set to the "tune" of a soul-less corporate simulacrum of country pop -- it is the second vignette that is genuinely abhorrent. 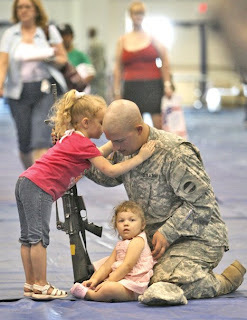 Families ripped asunder by war: A mother consoles her children as their father departs to kill on behalf of the State (left); a man torn between his God-ordained role as father and State-appointed role as soldier embraces his children before leaving them behind (below). The scene begins with a middle-aged couple walking out of their home, each of them flanking a daughter dressed in a BDU. 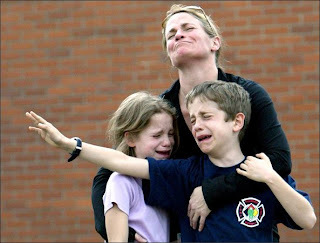 Their little girl, obviously, wasn't raised to be a "brood sow"; she's a fully realized member of the killer caste. "Somewhere a man and woman ... are waving their girl goodbye; for gone are the days of pigtails and curls and candle-light lullabies," keens the "singer" in the video's soundtrack as the couple and daughter hold hands in prayer. "If they had their way, she'd stay young forever and never be far from home. But freedom has drawn her heart to danger's shore -- and for freedom they'll let her go." Ah, yes: "Freedom" -- defined here as a gift conferred by the Almighty State on some, through the expropriation and death of others. The video ends with the wife and son being visited by a Marine chaplain who confers on them a folded piece of cloth in exchange for their living, breathing, irreplaceable husband and father. His life was extinguished carrying out what George W. Bush, in a voice-over, describes as "the highest calling of history" -- that is, enforcing the divine will of the State through lethal violence. Mr. Bush, no stranger to blasphemy, insists that their mission resonates with "the words of the prophet Isaiah," as recorded in chapter 61:1 ("The Spirit of the Lord God is upon me; because the Lord hath anointed me ... to proclaim liberty to the captives, and the opening of the prison to them that are bound"). Christians who genuinely understand that passage recognize that it foretold how Jesus Christ would liberate from the captivity of sin those who accept Him as Savior. As the High Priest of Washington's murderous Civil Religion, Bush follows in the jackboot-steps of Lincoln, Wilson, and their damnable ilk in depicting the State as savior. If that gesture seems similar, there's a reason: American schoolchildren reciting the Pledge of Allegiance in the 1940s (left); dutiful German citizens at the 1936 Berlin Olympics offer the same gesture of allegiance to their version of the welfare/warfare state (below, right). Throughout the United States today, Americans will celebrate the sanguinary majesty of that State and its pitiless apparatus of mass murder and repression. We should instead be celebrating the divine gift of individual liberty that was the focus of the "lawless and malignant" insurrectionists who gathered in Philadelphia -- disreputable men like Jefferson, Adams, Franklin, and Hancock -- to shout their defiance at a previous globe-straddling empire. What if, instead of starting every day being marinated in the language of submission (to pledge "allegiance," after all, is to proclaim one's status as a vassal bound in service to a feudal lord, or "liege"), youngsters were taught, on a daily basis, the principles of self-responsibility, individual liberty, and principled rebellion? As I stated earlier, if this kind of thing were to become common, our rulers would simply criminalize the Declaration. They've done it before, and they would be more than happy to do so permanently. The sobering truth is that, due to the cultivated docility of the American populace, Jefferson's document, much like the Constitution created eleven years later, poses no threat to the designs of our rulers. Happy 4th Will. Another excellent, if despair-inducing essay. Sic Semper Tyrannis indeed! when do we stop talking? they advance as we speak. Rise up in the name of principled opposition! Christian and Jewish theists, Mormon henotheists, secular atheists and pagan pantheists of this land, rise up! Unite for one single cause, for one single purpose! Fight for your liberties! Oppose the internationalist tyrants, the Power Elite, who run this central government and are wielding their influence in, and building up, regional and global political constructs, corporations and institutions. Our politics is a sham, only able to enthrall the most gullible, hapless hack. The ruling elite control the national media and determine all national political policies, but they're full of hubris and overly confident in their supposed victory. But we still live, and while we live, we must resist them every step of the way! Do not submit! Ignore the 4th, rip it out of your calendar! Wherever the 'Star Speckled Banner' plays, remove yourself from that ridiculous moment or sit it out. Don't play along with the facade; it's all a sick joke! Make and distribute freedom flyers and litter the land with them. Christian, what will you do without liberty? You want to offer the Gospel of Christ to others in peace? Not if you're holed up in a sound-proof, solitary confinement cell in a KBR detention facility. Once you procalim Jesus, the guards will isolate you and shut you down -if you live long enough. Atheist, what will you do without freedom? For you, this life is all you've got. Do nothing and waste your precious limited time. New Agers and neo-pagans, want to be left alone with your beliefs? It won't happen if you sit idly by while the State assumes supremacy over all. The State approves of no competition, just ask the practioners of the Falun Gong Buddhist sect and the Chinese House Church Christians. In all things, oppose and resist the ruling class and their State. Nothing will change until we act; in fact, our circumstances will progressively worsen until we do something. Constantly speak out. Let others know what we think. Dump the two sided National Party and condemn them. Call out the politicians by name and ridicule, disdain and harangue them. We must wear down the State's sycophants and idolators. Let's create an overwhelming sense of discord because things are not right. This land must begin to convulse with the sound of fury and indignation. Oh, my dear brother Will -- the stories I could tell of LTC Russell. I was member of the same church he joined after coming home from Iraq. God save us from such political patronage, and the way this man proudly absorbed the noisy "hero's welcome" from that huge congregation. There was not a note of humility in that man. A short time later, I forsook all institutional churches and have been leading a house church ever since. The 'elite' will not need to concern themselves with surveillance so long as the populace ring their own bells to which they also dutifully salivate. I do not like The Star Spangled Banner in any form or version other than that of Jimi Hendricks'. His is an honest rendition. "Our national anthem can help each of us engender feelings of unity for each other, as children of God. Feelings of unity in this sense is associated with the concepts of faith, hope, and charity. Without faith, hope, and charity for our fellow man, there is no faith, hope or charity in our Savior. "As we act together in unity using true principles, we have much more spiritual strength than if we attempt to act individually. That spiritual strength can be the source of all other strength through following the Gospel of the Savior. "Our national anthem can also help each of us engender feelings of patriotism for, and loyalty to, the country in which we reside. The opposite of patriotism and loyalty, in this context, is sedition and rebellion. "If I fail to recognize the multitude of rights that are protected by those entrusted with the government of the country, focusing too much on those few rights they may be lax in protecting, I may become guilty of sedition and rebellion." Hey, how's that for simply saying I prefer America the Beautiful?!!! Katharine Lee Bates wrote the lyrics to America the Beautiful after a trip to the top of Pikes Peak, Colorado, in 1893. Her poem, America the Beautiful first appeared in print in The Congregationalist, a weekly journal, on July 4, 1895. Another great and timely piece Will. Unlike some of the others, I say we should continue to celebrate the 4th - for what it actually represents. The violent overthrow of a despotic and tyrannical government and the loss of the freedoms we have endured since. There is nothing wrong with celebrating the very good people who you live amongst while suffering the burden of the Leviathan state - just be very clear about what the celebration really means. It is also nice to see that at least one other of commentator recognizes that there will need to be a unity across faiths - and absence of faith - recognizing that we are all equal, to effect change. As far as said poster's question of what to do? Leviathan presents many large soft targets - find one, observe it over time and formulate a course of action. The cogs that drive Leviathan live amongst us in our communities, shop at our stores attend churches/schools - let them know they are being patiently watched and why (which is a big part of what Will and his poster's are doing here in my opinion - I'm sure Will's blog is read regularly by the overlords too). Feed their paranoia and they will eventually present the opportunity (and they came pretty close, once again, with the FLDS fiasco). Daughters to serve a brothel. Now. Start finding the like-minded in your neighborhood. Start stockpiling supplies. Start learning how to defend yourself. Let's stop talking about whether or not this is happening, and start sharing operational intelligence. Will, I'm so glad the liberty movement has your writing skills on its side. It's like listening to a modern day Samuel Admams. When the truth of the "pledge" sunk home,several years ago, I immediately quit participating. Afterward I explained my reasoning to a dear friend of ours who was simply besides himself at my effrontery. That I would be so boorish and stick my finger in the Fatherlands eye! Indeed! 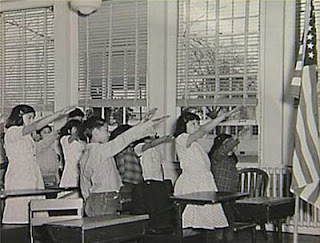 Even describing how kids used to recite the pledge with outstretched arms was thought to be loopy... but there you have it in black and white so to speak. When vast numbers of people within this American society begin to acknowledge, and then fully realize, that our governments are evil, serve evil and destroy Good, then we may begin to halt the evil machines throughout America. Make no mistake. It will take numbers. HUGE NUMBERS!! When the people fully understand and accept the FACT that NO ONE in congress, the executive and judicial branches represent them, and, with few exceptions, never have, but rather bow to evil, for their own selfish interests, then progress will take place. "When vast numbers of people..."
in all of us, good and bad. It's called "an empty belly." to it. God is not mocked. Until we change out society from the ground up, developing local governance so that capital may if it wishes go to other lands, we will never have a just society, nor will we allow other countrie to develop as ours have done, nor will we solve the problem of immigration control. We face the same problems here but now is a global age so I propose we unite internationally, in the US & UK, aiming to create new power structures at the grassroots level at the same time recognising the state-level need to abolish corporate agricultural subsidies (presently half the EU budget, 60 billion dollars and a chunk of the US budget, too). It may sound ridiculous, but as someone dedicated to non-violence and a follower of Jesus message I suggest the movement be characterised by blank placards (to symbolise a new era) and public picnics/free food sharing, which can be militant, eg road blocking, town hall closing down if necessary. I suggest we attempt to mobilise first on Sept 11th 2008 (anniversary of Mahatma Gandhi launching his Satyagraha non-violent campaign for Indian independence in 1906, among other less savoury things). I've recently set up a facebook group, which you can find at Freedom Picnic Campaign and upon which the call to militant picnic at places of your choosing, ideally those which symbolise empire will hopefully go out on in due course. We hope you will join us - food sharing and global solidarity being profoundly Christian symbols, aswell as representing the non-consumer, self-reliant relations that must lie at the heart of any new society worth its salt, that we are called to build. In short, a good seed..
we are facing right now. be a very nice "new" beginning. we need to take a step back and really look at what is happening. we're seeing biblical prophecy being fulfilled. we are more quickly moving towards a one world govt. we cannot stop that no more than we can save the planet: God said the former is going to happen and that He'd destroy the latter. i'm not saying that we stop being a light unto the world, but i think everyone needs to seriously think about how to maneuver/function in the current system(s) we live in. there's one portion in the bible where a bad servant, who is about to get fired, goes to his master's debtors and collects large portions of their debts and writes the other portion off. his master then decides to keep him because he was able to collect much of the debt owed him in just a few days, than (i assume) he was able to collect on his own. so he keeps his servant. then Jesus replies how it was a shame that the children of darkness are so much wiser than the children of light. i got a speeding ticket the day before i went to iraq. i thought it was unfair because i did not see the sign. my first ever speeding ticket (well, off-post). i was not going to win this one, however, i got the ticket thrown out. how did i do this? through my sister, i found out that if i paid a certain amount, i could get put on probation and with no other incidents w/i a year, it goes away. it never shows up. well, if i was going to be in iraq for a year. what was there to lose? so i paid. now i got a clean record. in the long run, i will save thousands of dollars AND if ever i get in a court case, no lawyer will be able to use a past speeding transgression against me. the lesson here is that i had just moved into a new area and did not know the system: the police, the judge, the court system. just as Jesus once moved through the crowd to avoid being thrown over a cliff, we have to move through this demonic system and survive. i mean heck, those in power are doing it?! so why aren't we? another example. i think OJ was guilty as crap, but he got away with it. how? he had money and got two good lawyers. that's how the system works. people get away with murder (ie: public officials) all the time. OJ followed the principles of this world as well as his lawyers. i think OJ's mistake (aside from killing two people) was underestimating how corrupt the system is. therefore, he basically got hit up with a civil suit (basically double jeopardy) for the exact same thing, and now has a huge debt over his head. we gotta start studying the system, learning how it works, how to work within it, or else we will break ourselves or even become victims trying to change something that cannot be changed. will do(?). Do we only go along and live in the lier's world, or do we live HIS WILL AND OPPOSE (the father of lies) NO MATTER WHAT OUR OWN FATE? Maybe you've considered that the prophesy of God's destruction of the world rather than meaning actual physical destruction might in stead be a spiritual one, as with the annihalation of the self we are called to surrender in subservience to Him? Personally I prefer communionism, the humble food share as the new form of government. Please begin again, every locality is potentially a new and Godly, truel democratic state-in-the-making! When I say communionism I mean political communion not Leninis communism. Please listen to me. The spiritual sharing of food, in recognition of the divine miracle in accordance with Christ's teaching should be at the heart of the human gatherings for local decision making..
"I think I'll pass on the kibbutz"
The Israeli experiment of 1948- is not a valid comparison. It was, after all set up with collusion of the state government in peculiar, unique (and some would say illegal, invasive and occupational) circumstances. Early Christianity is a far better comparison, a movement which was counter-cultural, anti-imperial, open to all and in which everyone took it in turn to lead the prayer. these communities held some but not necessarily all property in common, exhibiting a commonsense and humanity that is far from your stereotypical, doomed idea of utopia. This was the case of course until it got co-opted by the very Empire who crucified the founder of the movement. several million people to make room.."
Democracy from below is not an unaccountable centralising force with some nice sounding doctrines to ensure compliance of the masses in murderous pogroms, as is the case with the various examples you cite. Fascist states such as the one we face and the "communist" states in the sense in which you are referring have much in common in that they are centralising, bureacratic, unaccountable, both internally (domestic) and externally (internationally) imperial. They use the utopian language of democracy (in the 1st case, eg in US, UK, EU and elsewhere) and communism (in Soviet era) to justify policies and ways of organising society that were anything but. That is why we must build it anew from below, left and right libertarian in common cause. We who believe in a world without oppressive hierarchies are the same, we just use different language. And where we differ we just need to listen and learn from one another, for at the heart we are the same flesh and blood, and our quarrel is not with one another but with the system of powers above us. Marx himself said he was not a Marxist. when he saw what was happening to the 'revolution' (which he was admittedly far too impatient for) and that his important insights into the nature of mercantilism and capitalist-imperalist exploitation had become the twisted tool of the demagogues you mention. Marx's key recognition, the point of unity between genuine democrats of all political stripes is that we must seize control of the means of production. and this means the land, the resource from which all wealth and collective political power is derived, and so we must seize control of it back, collectively in each locality and in common cause with others who would do likewise elsewhere in the world. Mark, Will, there is no need to argue. You can both get what you want. You only need to refrain from warring on each other. This concept is called Panarchy.